One of the major things that all defenses struggle to do well is line up correctly to a formation. Most coaches spend hours of practice time every week working with their team on how to correctly align to each formation. What makes this more difficult is the variety of different formations an offense can roll out in a short period of time. 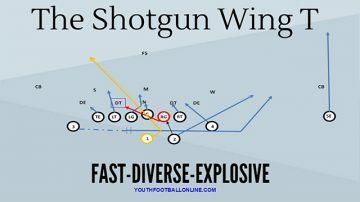 Some of the leading offensive minds in the college ranks have seen this weakness and have used the Sugar Huddle as an effective method of stressing defenses and getting them into a position where they are not aligned correctly to defend a particular formation. The Sugar Huddle itself is a simple wrinkle that is easy to install and execute yet adds a massive amount of stress to the weekly defensive preparation. In the Sugar Huddle the offensive line will create the huddle 2-3 yards away from the ball with their backs to the ball directly behind their position. The goal is that when the huddle breaks they are able to get aligned in a three point stance and run the play in the shortest amount of time possible. 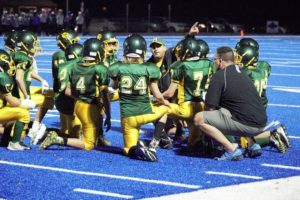 When the Quarterback steps into the huddle he will tell the play to any receiver who will be on the perimeter of the formation first and send them out to their position. Once the Quarterback has sent the receivers out to their position, he will then step into the bulk of the huddle to tell the rest of the team the play. Once he has repeated the play twice he will say break and the players will quickly line up in their positions so that the offense can snap the ball in under 2 seconds. The result is that the defense must adjust to the formation and get aligned quickly. While simply aligning in a formation can stress the defense out, the major advantage of the Sugar Huddle is when the offense uses it to get into unbalanced formations or run trick plays. Unbalanced formations are always difficult for defenses to align to, but when the offense adds the stress of the Sugar Huddle it forces the defense to align in a matter of seconds. The result is normally an overload that the offense can exploit to get the first down. A popular strategy for combating the Sugar Huddle is to have a set defensive front for the defense to align in. This allows the defense to align quickly regardless of the offensive formation. The obvious downside of this is that once the offense knows how the defense is going to align it can attack the weakness of the defense. To add extra stress to the defense offenses can run shifts out of the Sugar Huddle. If the defense is using a base alignment that they are using to all formations out of the Sugar Huddle they will align quickly. Beyond attacking the weakness of the formation the offense also has the ability to use a simple shift to add an extra blocker to either side of the formation and create an advantage against the defense. Every offense wants to find simple ways to stress the defense. By adding the Sugar Huddle to your attack the defense will be forced to recognize and align to formations quickly before getting their mind on the next play. The effect is a defense that is either misaligned, not focused on the play or both.